At The Great Frame Up, we are proud to offer you a complete range of art and framing services and products to help you bring the joy of art to your home or office. We can help you frame your treasures, whether it is an original work of art, lithograph, or 3 dimensional object such as a wedding dress. All of the work is done on the premises by our talented design staff who are supervised by certified picture framers. The DIY and custom framing process is accomplished by using in-stock frames, mouldings, mats, and glass, which means they are ready to hang the SAM afternoon. Unique mat designs are fashioned by using combinations of rag, acid free, suede, linen, or regular boards to enhance the art from a choice of 1000's. An expert and experienced design team will assist you through the entire process. Ours designers have had years of experience of helping you choose the right combination of materials to bring out the best in your art. Preservation framing with high value art the very best is used. This should include rag or acid free matting, 98% UV blocking glass or plastic which inhibits the art from fading. An acid free environment for the art is a must from the front to the back. Encapsulation for the art is also available. 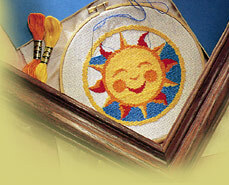 Needlepoint and object art are a way of life at The Great Frame UP. We have framed such items as the hood of a race car, wedding dresses, shovels from ground breakings, guns, jerseys (our specialty). drymounting is the process of mounting a picture to a clay coated board, or foam board to make the art lie flat and help remove some, if not all of the wrinkles if there are any. We can mount, on site, up to 40 x 60 and at our factory warehouse we have the equipment to mount to 48 x 96. Frame repair We can help you repair most frames on site the same day. If you only need the glass or matting replaced that is as easy as saying "Let's do it!" It only takes a few minutes. Corporate art and framing This is where we will send a design expert to your location to help design an office, restaurant, school, meeting room, hotels. We can do it all from the art selection to the delivery and hanging. We have framed for such major corporations as, Hyatt Hotels, J. Walter Thompson, Wells Rich Green, W.W. Grainger, University of Chicago, Northwestern University, Smithsonian in Washington DC, Holiday Inns, Field Museum, W. Clement Stone, American Express. The Sign Shop department for signage and graphics We have the capability of making banners, plastic yard signs, graphics for store windows, cars, boats. We give you a choice of vinyl 5 year life to 12 year life.